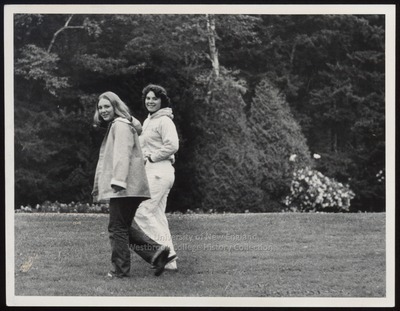 "A Leisurely Stroll, Westbrook College, 1970s"
Two Westbrook College students stroll leisurely through Evergreen Cemetery in this 1970s candid black and white photograph. One young woman wears blue jeans and an unzipped, hooded rain jacket; the other wears a pair of white jeans and a hooded white sweat shirt. Both look back over their shoulders and smile at the camera.